It’s hard to know how to commemorate something that’s still happening. Three years ago, the Assad regime fired rockets containing the nerve agent Sarin at civilian neighbourhoods in Ghouta, in the suburbs of Damascus. Earlier this month, the Syrian army dropped chlorine on the civilians of Saraqeb. In between there has been repeated use of chemical weapons, which have become an appallingly normal feature of Assad’s brutal and criminal campaign. 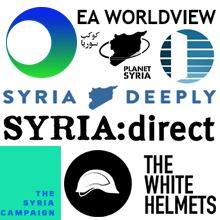 The Ghouta massacre still stands out. It’s not just because of the scale of the killing, with around 1,500 casualties. It’s not just because of the fact that of all the ways to die in a war, by chemical poison must be one of the most brutal, the most painful, the most appalling. It’s because of what the international community did next. It said it would do something. Having made the case that it was morally and politically necessary to punish Assad’s crimes, Obama quickly u-turned and indicated that, in fact, nothing would be done. One of the reasons for this retreat was a vote taken in the House of Commons on 29th August 2013. Parliament voted 285-272 against a government motion that called for punishing Assad if there was UN support. What’s interesting about the debate, and the national discussion surrounding it, is how narrow-minded and insular so much of it was. There were valid criticisms of the government proposal, and of the sort of intervention being discussed in the United States at the same time. But instead of having that discussion, many people simply wanted to do some soul-searching about Iraq. Iraq was mentioned over a hundred times in the debate. That’s not objectionable in itself. It would be much more worrying if parliamentarians hadn’t reflected upon the invasion of Iraq in their discussion of another British engagement in the Middle East. But the comparison was fundamentally false. The invasion of Iraq caused large-scale loss of human life, undermined international law and inflicted wounds that will take decades to heal. These very same results have been achieved—and worse—in Syria, not through action, but through inaction. The then Leader of the Opposition, Ed Miliband, opposed the government motion on Syria largely because of the political divisions within his own party. The Labour government’s decision to join the US invasion of Iraq in 2003 is an open wound in the party, and is overwhelmingly unpopular with its members. Effectively, the Labour leader was more concerned about the internal dynamics of his party than in the protection of human life. Whenever politicians and commentators come to talk about foreign policy, they tend to do so as if the rest of the world doesn’t exist. Now more than ever, as Brexit risks leaving us as Little England, weakened, isolated and anti-internationalist, we need to reflect on the self-indulgence and self-obsession that permeates and pollutes all of our national conversations about foreign policy. We need to move beyond attitudes of solipsism and isolationism. We need to think about more than Britain’s standing in the world, or factional politics within and between political parties. The price paid for this deadly narcissism can be measured in the dead of Syria. Miliband announced after the vote that parliament had spoken for the British people. But it wasn’t a debate about the British people. 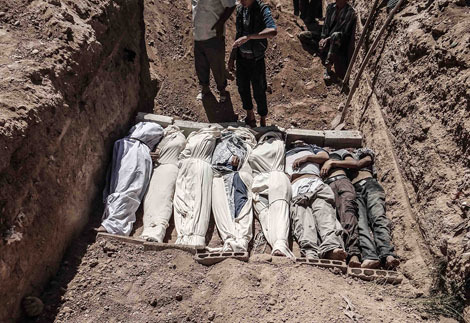 It was a debate about the people of Syria, who, three years later, are still being massacred with poison gas. 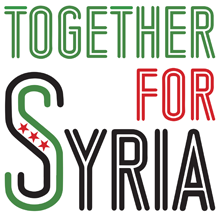 George Morris volunteers for Rethink Rebuild Society, a Manchester-based Syrian advocacy and community organisation. 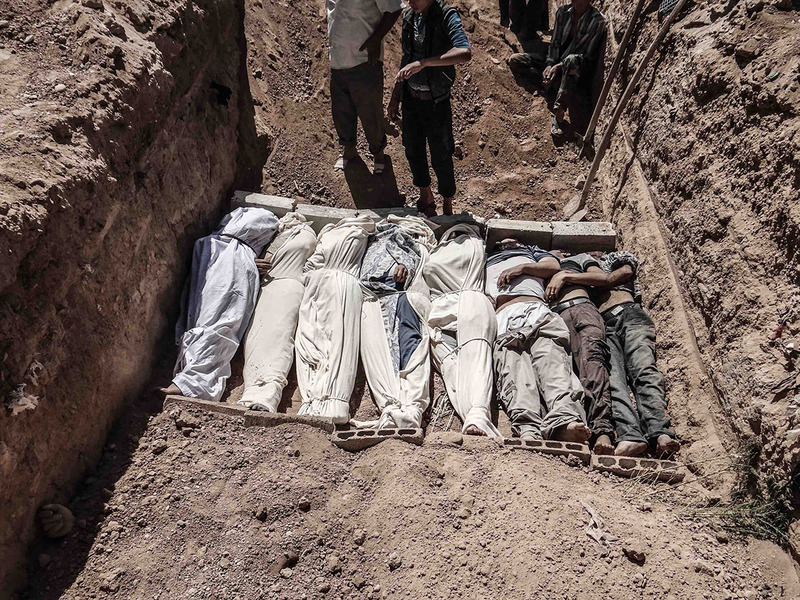 Photo: Corpses are buried in mass graves during the aftermath of chemical weapon attacks in the Damascus suburb of Ghouta, Syria on 21 August, 2013. Rex Features/AP. Video: “They are all liars…” A survivor of the Ghouta chemical weapons massacre speaks.